Thought I'd just keep tabs on the happenings of the day, regardless of how mundane, as an example of our ordinary days. 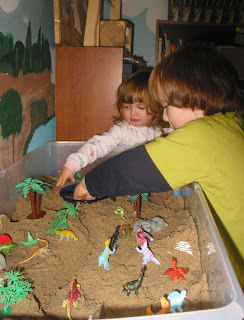 This morning the children broke in the new sand table. We put a blue bowl in for a pond, and I had some little shiny smooth pebbles that Trev wanted to bury his dinosaurs with, so we added those as well. Next Meerkat Manor (an Animal Planet show about a family of meerkats in the wild) was in order for a few minutes. 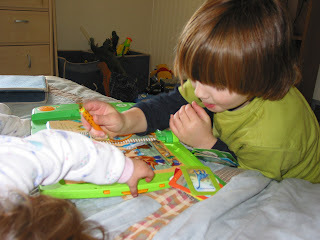 Then back downstairs for Trev to play in the sand while Maddie played with the magnets and various metal scraps. Next was back into Trev's room to play with LeapPad for a while, and while he was doing that, Maddie was scooting around on her new ride on. Krypto the Superdog was up next to entertain for his fair amount of time while Maddie went down for a nap, and I got back to work cleaning. Trevy and I read for a bit, Pig Jigs. We have always before finished the books, but today he tired of it rather quickly, so we only read 7 pages, I think. Ge got sort of frustrated with the word "slips". And the sentences were getting long, (A big pig jigs on a hill and slips on a wig) so he was sort of overwhelmed, I think. Also, it's been several days since we've read, so I'm sure that has something to do with it. After he recuperated from that (watched tv) I gathered the materials up for an experiment we've been discussing, which is making Rock Crystal candy. It involves saturating water with sugar until the water can't hold any more sugar, and some remains on the bottom of the glass. 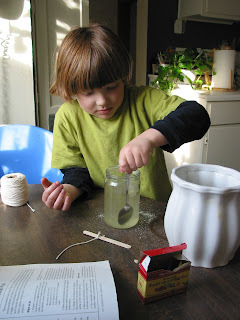 It got a little aggravating, it says to do it one spoon at a time, and after about 20 spoonfuls (stirring and desolving between each one) Trev was wanting to get back to his cartoons. We then started adding them by two's, and then threes, and then finally fours, and then we just dumped the rest of our sugar into the glass. We're out of sugar, and it still wasn't saturated. It must have been at least a cup and three quarters of sugar that we used. Hopefully it will still turn out. If I get to the store tonight, we'll warm it up to add more. Now we just let it sit until the water evaporates, I figure it will be probably about two weeks. 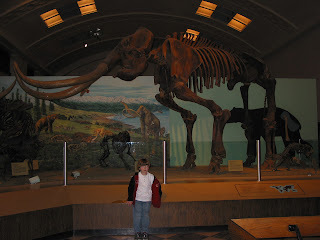 Eric got back from s kiing, and Trev inquired about going to the Utah Museum of Natural History. So we went. It was a nice visit. 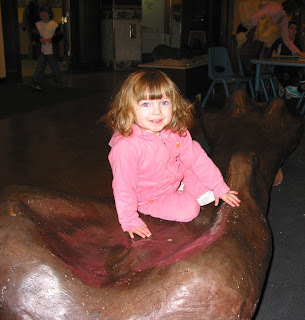 The mammoth skeleton was cool. I'm always fascinated by the size of them, every time I come in contact with a "life size" replica. whoosh. 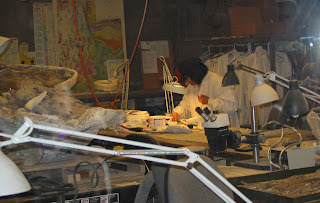 While there we got to see someone working in the lab. I think they use that one for paleontology only, not archaeology. Upon getting home We got out the rubbing skeletons I've been meaning to craft with, I think Trev was sorta tired, and although he did a rubbing, he wasn't much interested. Think he's done for the day. Earlier while I was in the kitchen cleaning, Maddie pipes up with "Ilove you!" and I laughed, and said "I love you!" Was supercute. I heard it for the first time probably a couple of days ago. and then on the way to the museum, somebody did something irritating while we were driving, and she said "Jackass!". "You tell her, baby." said I. We stopped at Wasatch Pizza to order a pie on the way home, and when Eric put Maddie in the truck, she screamed "aaaaack! Jackass!" to him. Was hilarious. I don't condone name calling, of course, (not very spiritually evolved of me) even though I sometimes do it (obviously) but it's still humorous to hear it from a tot. Time for pizza, and then probably reading for me the rest of the night. Today was perhaps a bit more busy than most days, but it was still pretty ordinary. Let us know if your rock candy works! 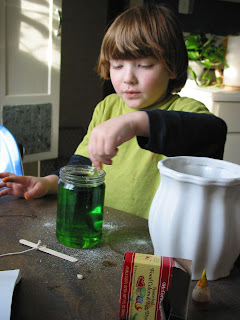 We tried it a few months back and it didn't work:( Like you said, we saturated the water and then some, I heated it and put more in and I think we may have added too much sugar. We let it sit for 2+ weeks and nothing. The top thin layer got hard, but the rest was more of a syrup? Welp, it's been well over a week, hasn't it? and it's syrupy as well. I saw another recipe at the website I noted, think we'll try that one, instead.